Out Feb. 2. Order from Amazon now. What do two Faces do when their lead singer (bon vivant Rod Stewart) doesn’t show up for the Ooh La La recording sessions? They work on a soundtrack for an obscure film by actor and friend Alexis Kanner (most famous for his guest roles on the late-‘60s TV series The Prisoner), and draft the uppermost rank of British rock royalty to play on it! Indeed, given the pedigree of the personnel on this project, it is rather stunning how obscure this 1976 album from Faces members Ron Wood and Ronnie Lane remains, having only been issued on CD abroad and for a brief time at that; one suspects it has much to do with the flop of the film (which appears to have only been screened at the Canadian Film Festival), and the fact that the original LP was released four years after it was recorded in 1972. 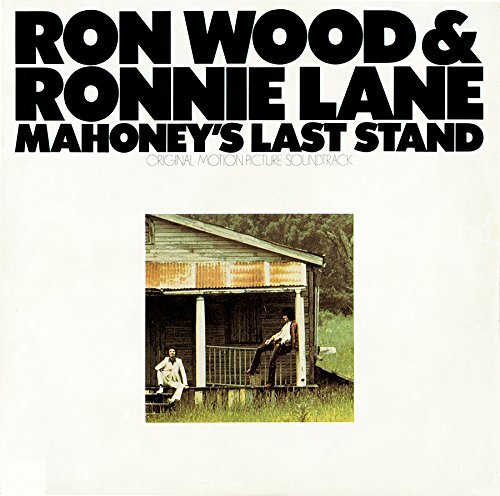 Just listen to the roll call of session men on Mahoney’s Last Stand, which was produced by Glyn Johns, himself a British rock and roll noble of good standing and fresh from producing Paul McCartney and Wings’ Red Rose Speedway when he worked on this album: Pete Townshend (guitar and “special electronic effects”), Blind Faith and Family member Rick Grech, fellow Faces Ian McLagan and Kenney Jones, soon-to-be fellow (for Wood) Rolling Stones habitués Ian Stewart, Bobby Keys, and Jim Price, Micky Waller (Wood’s fellow member in the Jeff Beck Group of the late ‘60s), and Grease Band member Bruce Rowland to name but a few. As for the music, much of it has a rustic, rural feel in keeping with the film’s setting, which follows the misadventures of a recluse who rents a ramshackle farm in the Canadian countryside, with some nods (“Woody’s Thing”) towards the blues-rock Wood would explore with Keith Richards in the Stones. But without a doubt the highlight is Lane’s “Just for a Moment,’ which is here in both vocal and instrumental versions; it’s a prime example of the wistful roots-rock that made Lane’s post-Faces solo career so compelling. Richie Unterberger’s liner notes examine this little-known detour in the careers of two British rock legends…fascinating for Faces and Stones fans!